The centrality of what large and small organizations aim to achieve aside profiteering may also be to constantly aspire to satisfy stakeholders' interest. However, in actualizing this aim, most often than not depend on the human effort either from the owner of an enterprise or from the staff of the enterprise. 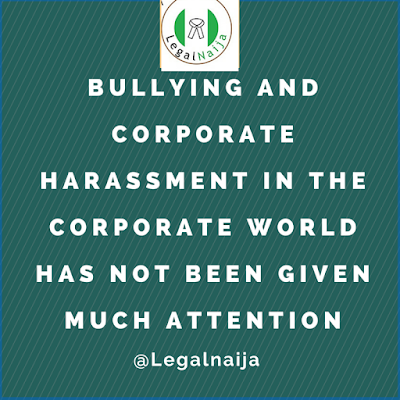 Bullying and corporate harassment as a deleterious issue in the corporate world has not been given much attention, the reason could be because there are fewer literatures on it or because the victims of a bullying circumstances usually don’t speak up for the obvious economic reasons. This piece which relies on ancillary data and personal experience wishes to address the fundamental hindrance why most organization could be in business for years yet without significant progress in terms of profitability and healthiness. The theme of this piece also spins on understanding the human side of every business in order to proffer solutions to what the author termed as corporate bullying. Bullying in its basic usage is synonymous to words like Intimidation, mistreatment, oppression, victimization, Harassment, oppression, hounding, harrying. While a Bully may also mean the same as a tormentor, persecutor, oppressor, tyrant, intimidator and aggressor. Personality Clash: In Africa, it is often said that one of the reasons why none of the human fingers is equal is because nature wants to remind us that no human being is the same in orientation and in personality. The finger prints security checks also tells this story better. With this background, it is on record that bosses tend to bully staff who they think they cannot work with as a result of incompatibility of personality colorations. Deadlines: Deadlines are usually cash lines. Clients see exceptionality in paying more to organizations who meet deadlines. Aside repeated buying, referrals are usually key for organizations who are able to meet deadlines. More often than not, supervisors or owners of the business get too emotional on subordinates for not meeting targets and set deadlines. From research, some organization award punishment for not meeting up to deadlines. Such punishment could range from monetary surcharges, forfeiture of day offs and other fringe benefits. Although, this piece doesn’t plan to address punishment implications for offences, however, there should be a prior acknowledgement from parties to employment on how to deal with ineffective work operations as against arbitrariness of disciplinary operations. This is what company manual and employee hand book should address. Aggressions transfer: The world is said to be a war zone, hence for organization being a unit in the world, the impact is clear. No soldier would be in the battle field smiling all day, no no no! Not even in Hollywood or Nollywood movies. It’s usually a battle field, and this relates to organizations; battling between making more profit this year or losing out into bankruptcy, battle of getting more customers or your competitors have them, it’s a battle of lowering your cost to attain sustainability and battling of adherence to corporate governance issues in the face of economic upheaval. More often its only leaders and owners of companies that share some of these battles alone. Unlike a troop in the army where team work is actually team work. For instance a battalion that losses a war can all perish together in war front. However in corporate organization this isn’t so. Workers leaves and move on if the business fails, hence leaving the owner of the business to bear the bruises all alone. This is a typical sorry case and as such the enterprise owners is on his/her own. With of the understanding of this irony, the corporate leader seeks to result to being emotional whenever subordinates aren’t pulling enough strings in achieving corporate objectives. A story was told of a Lady Business owner named Bimbo who was suffering from husband battering especially during the weekend, it was told that this lady usually have an emotional crack down on every of her male staff on every other Monday /Tuesday during the operations meetings. Asides this, some unit heads having been verbally assaulted by her also transfer similar verbalized bully on their subordinates and so goes down the line. Aggression transfer creates a tyrannical organization and it has ruined goodwill of organizations. State of the business in not too distant time ago in Nigeria, I once worked with an Executive Director in a group of firms majoring in Food and Quick Restaurant Business. She was so furious about an HOD not been able to track operational lapses from his subordinate. She dragged the HOD to the HR office and instructed the HR to issue him a query. In the process of this instruction, she made such comment as this: this Company is going down day by day, and we must all go down with it is since we don’t want to do the right thing. That’s shocking isn’t it? The effect of this statement was obvious, within 6 weeks of that statement, both the HOD and even the HRM resigned from that organization. Now that’s the effect of bully! From experience, actions and inactions of corporate actors has over whelming effect on the corporate existence of an enterprise. 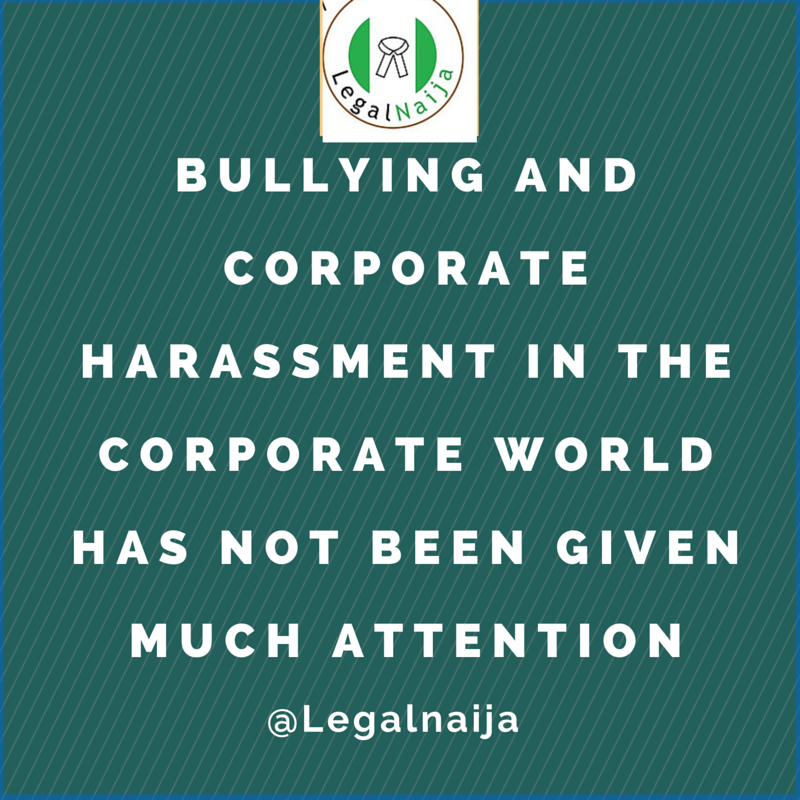 Bullying being an adverse action and inaction within corporate organizations has the following ripple effect to the existence of an organization. Below points sums up few of such effects. Lowers Staff morals: Performance of any organization would depend on the state of mind of the actors of the organization. You cannot have a highly disgruntled workforce in your organization and expect the best from them. Never, because people aren’t wood after all. They have emotions and the blood that runs through their vain often tell them whether the organization is favorable or not. More often than not when you verbally deal with staff, they transfer such to your customers. If you have ever heard a customer complain about the service of a company bitterly, and that such customer had to result to making such complain viral on the internet? Then I bet you to check out the ways supervisors or managers of that company interact with their staff, and you will see hostilities from top down. High Attrition rate: These talks about the rate of labour turn over in an organization. One of the basic signs you notice in a bully prone organization is that top managers leaves almost without notice. A good sign of a bullous organization job seekers should watch out for any time is companies recruiting regularly for top management position may not be a good place to work. Such companies only turn the HR department recruitment partner as against being a strategic partner in business. Talent forbidden zones: With the advent of the social media, there is no more hiding place for any hostile organization. Have you recently recruited someone and concluded with pay package as well as other terms of employment, only for him/her to resume, then you hear him call to say; I am sorry I am no longer interested! Yes it happens a lot right? Lol, Believe it or not out of every 5 situation like this, 2 of them has to do with reputation issues on the side of the organization. We now have social generations of workers who are ready to go the whole route of making background check on the organization who is poaching them. They contact your former staff to enquire how it is like to working for you. I once worked in an organization with open cubicle style of office arrangement. The Executive Director which happens to be the daughter of the CEO one day openly described the Procurement Manager as an inefficient dummy who cannot track simple supplies. But right there in my front was a job candidate who has just accepted to work with us and he was to pick up his letter the next week and then resume as Facility Coordinator. But guess what? He never showed up. A call by the recruitment guy revealed that he can’t work with such owner of the business who assault staff with words. Now how HR guys will interpret this experience to the owner of the business often becomes a major headache. Bad PR: Managing organizational reputation could be a demanding job, and contracting this to Perception Managers also doesn’t come cheap. But what is more demanding is when the owner of a business directly or indirectly damages the business image. According to Tomas Chamorro-Premuzic, a Professor of business psychology at the University College London; in his article; The Dark Side of Executive Narcissism: How CEOs Destroy Companies’ Reputation and Employee Morale; he stated that organizations led by arrogant, self-centered, and entitled CEOs tended to perform worse, and their CEOs were significantly more likely to be convicted for corporate fraud (e.g., fake financial reports, rigged accounts, insider trading, etc.) with this, the action and inaction of CEOs on the image of the organization cannot be over emphasized. Fortunately a lot of huge problems require simple solutions. Douglas Mc Gregor’s X and Y theory also sells even in this generation. To Gregor there are 2 types of workers in an organization, the X workers who is typically a lazy worker and a Y worker who is by a nature a workaholic. The strategy here is to give more work to those lazy leopards and monitor performance and attitudes while you endeavor to understand the aspirations of the Y employee to motivate him/her. Processes, Policies, organizations’ SOPs and daunting bureaucratic procedures could be a discouraging factor for worker’s performance. Some staff sees some policies as a signal to get them out of the game. It is advised that organization steam down rigidity on some processes for corporate gains. The essence of these policies should be addressed. Many are organizations preaches this but they fail to get the practice right. It is important that the Management would always make themselves approachable. Get along with staff and make some intimate comment when they celebrate special occasions to show you how value even their personal life. Open your office door wide so that people can approach and talk to you. The idea here is not that management should pamper staff but that management should listen to staff for the sake of the business. With this you will get maximum value and Return on human capital investment. There is need to act professionally irrespective of the situation. Emotional intelligence seems to be a song for the employees alone, but frankly speaking, we all need it irrespective of the level of our economic status. Try to read people and yourself then put them in the perspective of the environment so that you can get result and performance from people. This generation is a social generation. Hence, to draw from the monetary and non-monetary proceeds from any organization’s economic activities, the organization must have an healthy environment for individual talents to manifest. The epochal Elton Mayo experiment as carried out in Hawthorne in the United States of America reveals that the social structures and its impact on the workplace can affect job performance, hence corporate success. There is need to publicly celebrate staff, know their birthdays, anniversaries and like their comments on social medias. Although Mayo’s experiment on the impact of social structures on workers was conducted several decades before the advent of the social media, it is important to understand the social needs and background of each of our staff for us to get the best from. From the fore going, It can be inferred that bullying occur then there is weak leadership. Hence bulling has been identified as inimical to the progress of any organization. We have been able to establish that Manager or owner of the business may also act deliberately to the disadvantage of their organizations due to certain situations such as Clash of personality, deadlines on projects and the state of the business among others seems to bring out the devil within. The effect of this, is alarming aside having to do with public relational issues, organizations tends to lose top talent on a sporadic basis. To curb this, we advise solutions which include; demystification of policies and processes, practical open poor policy, the use work as punishment, getting social at work and understand the concept of emotional intelligence among others.